A chronic lack of sleep, a crowded subway or long commute, a sedentary lifestyle with hours on hours of sitting in an uncomfortable office chair looking at a 15-inch screen all take their toll on our bodies and lead us down the road of painful back, neck, and leg problems. In this fast world many don’t have the luxury or taking a break and visiting a physiotherapist or chiropractor and need a solution equally fast, but also easy and simple enough to be able to add it into their daily routine without disturbing their schedule. For today’s exercise, two tennis balls are all you need! Perform these simple exercises as often as you can and you might just be able to avoid a trip to the doctor. Start moving your hips on both sides, so that the balls roll down the back and massage it. If you want, you can put the balls in a sock so they don’t roll away. As with the rest of these exercises, you should find a pressure that’s comfortable to you. So if you feel the need to, perform this exercise on a softer surface or place a towel under your neck as a support. 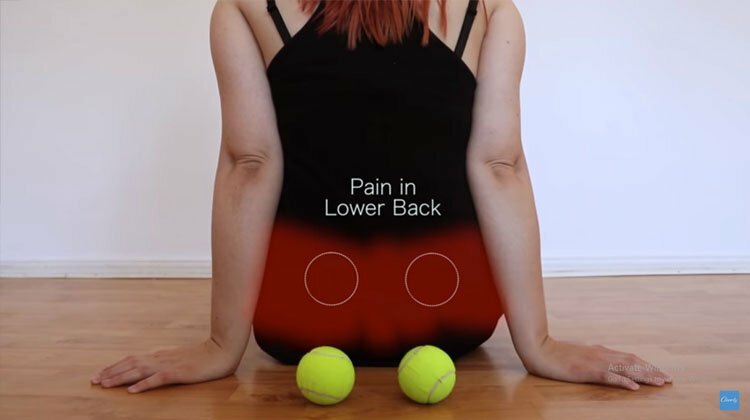 For relaxing your neck muscles, lie down on your back, stretch your legs out, and place two tennis balls (preferably inside a bag or sock) at the base of your skull at the area highlighted in the video, so that your head rests on the balls. Tense your toes and push the balls a slightly upwards so that you can feel a stretch in your neck. There might be some discomfort or a relaxing gentle pain during the stretch, but never a sharp pain and discomfort. Once you attain the stretch, relax your toes again and take at least 10 deep breaths. Repeat as many times as you want. Hip pain can appear when one wears uncomfortable shoes for prolonged periods, during sudden increases of bodyweight, sedentary lifestyle or because of old injuries. 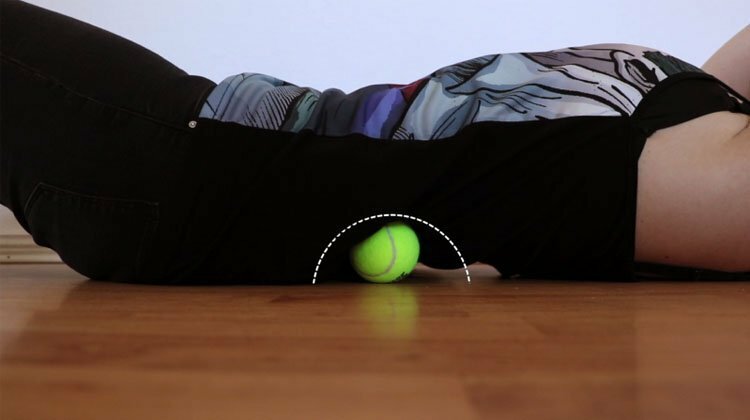 To relieve the pain, lie on the floor and place a tennis ball under one side of your hip as a support. Once you find the balance, slowly move your hip in a circular motion 12 times in one direction and then in the other. When you finish, switch to the other hip and repeat. Relieving tension in the shoulders is very simple, but can be very satisfying: lie on your back once again, bend your knees and place the tennis ball between your shoulder blade and your spine. Now start to slowly move your stretched-out arm over your body, head and the floor in a circular motion. Make sure you find a pressure that’s comfortable. You should feel a slight “sweet pain” that relaxes your shoulders afterwards. If at the end of your day you have a pain in your knees, this exercise might help you: assume a sitting position and bend one knee placing the ball on the inside. Start pressing the ball between your calf and thigh for 10 seconds, as if trying to crush the ball. Rest 10 seconds then repeat 8 to 10 times per knee. 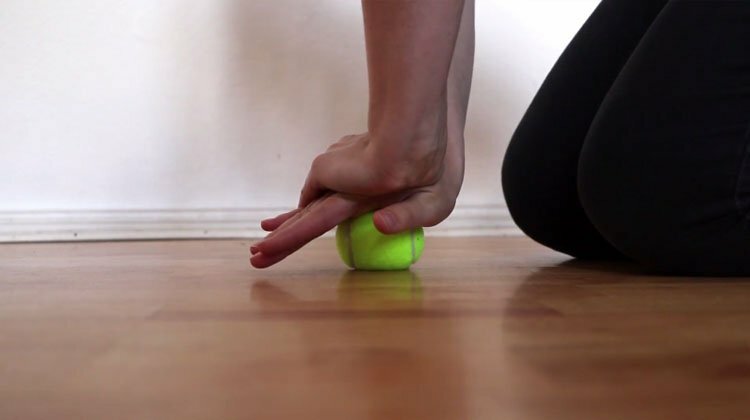 To exercise and stretch the foot reflex zone, place the ball on the floor and roll your foot over it. You can decide how much pressure you apply on it yourself, depending on the condition of your foot. 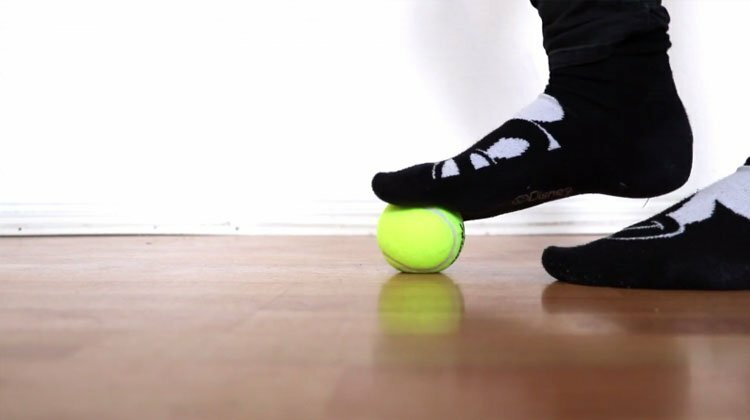 Roll the ball of the arch of your foot, your heel and the inside of your foot for 30 to 60 seconds. Once finished, repeat on the other foot. This exercise is also helpful for plantar fasciitis. If your work entails a heavier use of your hands, you might end up having sore hands at the end of your day. Sitting down and place one hand on a ball. Place your other hand on the ball to exert pressure, and “crush” the ball by dropping your weight on it. Try staying in this position for up to a minute while breathing regularly and deeply. Now move the ball from side to side and then up and down, tracing the shape of an asterisk in the palm of your hand for 2 to 3 minutes. Repeat with the other hand once done. You can also perform some of these exercises while standing and using wall as a support. 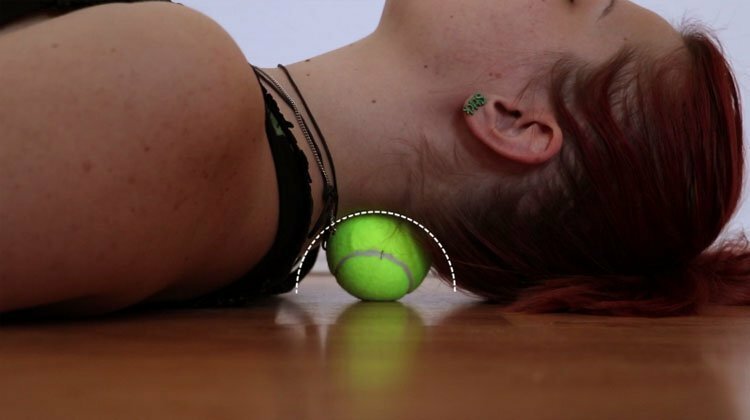 Simply place the tennis ball on the tense area in your neck, shoulder or back, lean against the wall and roll the ball in circles with the movement coming from your knees. While you may find tennis balls to be somewhat uncomfortable and hard initially, after performing these exercises, you’ll notice how your muscles are much more relaxed and you’ll be able to face everyday challenges with all the energy and vigor they require – all because of a modest tennis ball.